Tele-Pro Communications, Inc. specializes in structured cabling systems in the Greater Houston and surrounding areas and all of Texas. We have the expertise for all of your cabling needs. 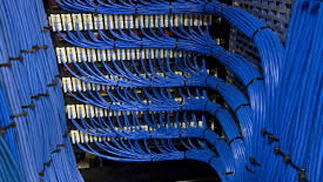 Our experienced team will professionally design and install Cat 3 (Voice), Cat 5e (Voice or Data), Cat 6 (Voice or Data) PVC and Plenum cabling, racks, patch panels, phone blocks and other related items. We provide all types of wiring solutions, including copper and fiber optic cable. We use flexible patching and wire management systems to provide you with the ability to expand and enhance the network as your business requirements change. Our latest telecommunications technology will give your business an advantage over your competitors. In addition to our standard cabling systems we also provide data center management in Texas. We think you’ll be satisfied with our products and services for all your telecommunications needs.